Yesterday saw another seed swap in the Courtyard in Hereford. It was great fun as usual. This year was a little different for me as I was doing the talk that the seed swap puts on. Each year they put a speaker on to attract more people and to provide some extra interest for those attending, so I was really shocked when they asked me to do it. She had been so excited to come a long and what it was and be a part of it. She was super well behaved all day, really helpful and polite, just a pleasure to have with me. I did a talk on unusual fruit and vegetables, which is one I've done for a few garden clubs now. It was really well received and people laughed in the right places and I had lots of questions at the end! I've already had a few emails contacting me about it and a booking for another talk in November this year. 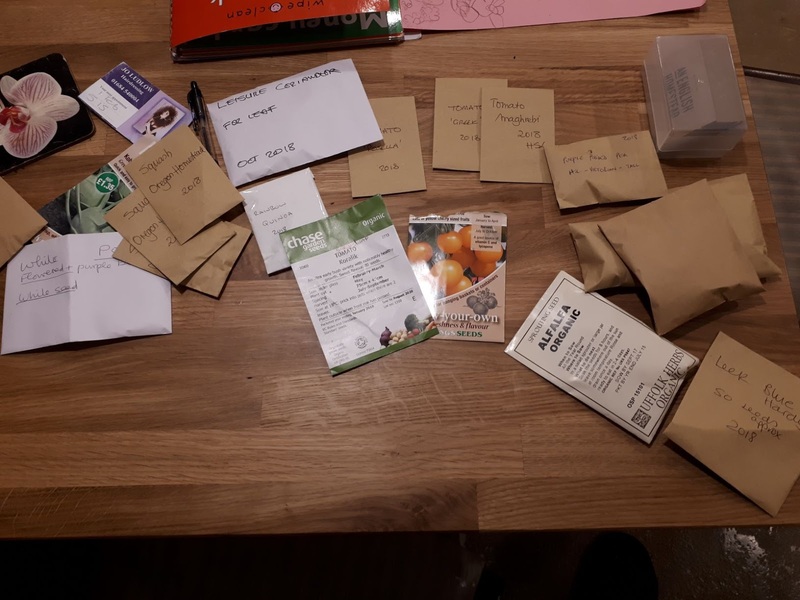 I also managed to get a good haul of seeds to try and grow (and a few to give to a few friends that couldn't get there). I'm really pleased to get lots of different tomatoes to try, something I always love growing. Also some seeds for the plant "bath asparagus" which should be fun to try and get growing as another unusual edible. 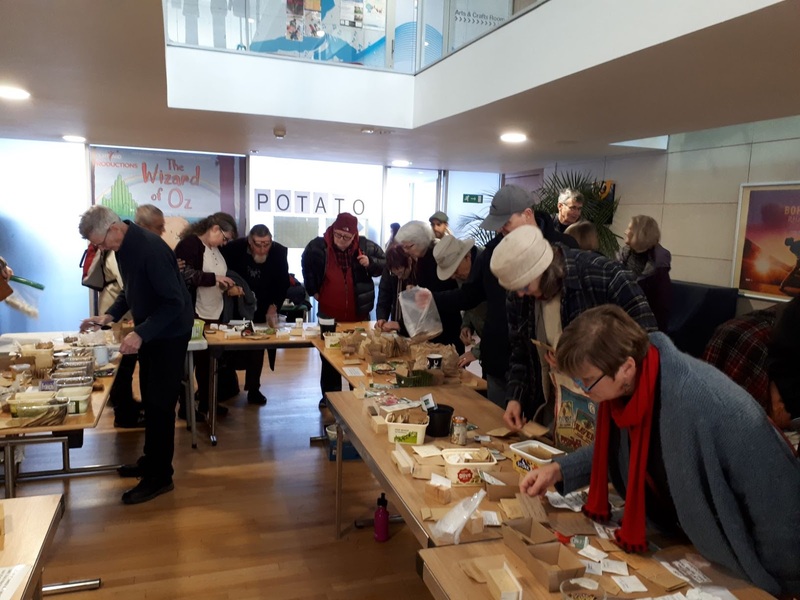 The seed swap group has also started selling potatoes for the first time. This was great and it's looking like something we'll carry on with in the future. This is great news for me as I picked up four different types of potatoes to try. Anyone else been to a seed swap this year? Have you started planting anything yet? The bath asparagus looks wonderful. Glad you had a good time. Far to early to start anything here but if the snow all melts off this week I will put in some garlic because I didn't have time to get any planted last fall. Looking forward to the growing season. I need to put my garlic in as well, got it sat here doing nothing but I was too late last year. Hope it'll do good enough now! Our local one is coming up soon, always well attended. Some people have their own tables or you can donate to the farmer's institute who have four or five tables end to end crammed with seeds. Swapping or buying for $1-2 so a great deal even if you have nothing to swap. Note to Ane re gardeners saving the world-my thoughts too. Sounds like a great swap, I like the idea of it being crammed. Ours was full at one stage but soon went down. We were lacking in beetroot seed this year and chard but maybe next time. I'm so desperate to start planting! Maybe some micros witht he kids is what I'll do first! Really enjoy your blog, thanks for all the work you put into it. Yes I have planted Mange tout. Chillies, peppers and tomatoes. I use a couple of warmed propagators in our conservatory. The light is good, but may try LED light this year also,as the light is more important than the heat. The light is good here in Carmarthen. I think LED is the way to get a good sweet peppers, don't quite get enough light otherwise. I might get some peas in the ground or at least in pots. Have some for the HSL and I'd like to see if I could get two crops from it in one year to really bump the seed up! Mulched my Japanese onions with homemade compost on Friday. Bought some really cheap veg seeds from Lidl too. Been digging over my homemade compost and found 4 huge potatoes for tea! Fed nine of us! Glad your talk went well! We've got out village garden club seed swap at out AGM next week. I suggested it after your blog posts last year and it was popular so it's on again. Glad it's doing so well! Shame you're not nearer really! I'd love to see what its like. I put them in the compost heap and I have had a few wees on it since so I guess that's pretty much the same. Most of the heap is worked over So I'll propbably grow my squash in the top of it this year then use it as compost the year after. Thanks and say thanks to your dad. Next time I'll keep them in a bucket, add urine, leave for a bit then add to the heap and see what it does. I like weeing on stuff so always keen when someone suggests it!